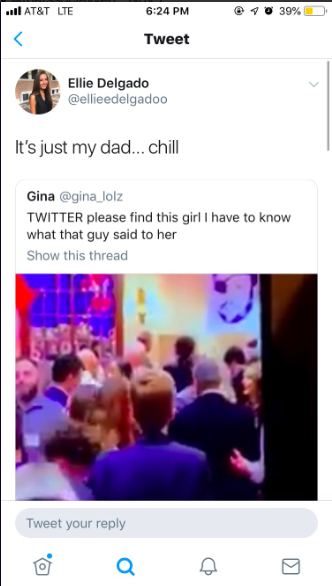 There’s nothing Twitter loves more than a mystery, and honestly, there’s nothing better than when the answer turns out to be a teenage girl who doesn’t want to hear about her dad’s love life. This video surfaced the day after an election day watch party for GOP candidate Dan Crenshaw, and people were super curious what the at-the-time unidentified older man had said to offend the young girl to the point of throwing up a hand and leaving him in the dust. Specifically, one Twitter user – @gina_lolz – just had to know what happened. The internet began guessing (“He said he liked pineapple on pizza!” and “the Star Wars prequels were actually pretty good…better than the Disney ones!”), but none of them got it quite right. The girl in question turned out to be Houston high school student Ellie Delgado, who was attending the watch party with her dad. She did, though, give people what they wanted – which was to know what he’d said – and the answer was honestly better than anything anyone had guessed up to that point. The tweet and video went quickly viral, and even Dan Crenshaw – Texas’s Second District Congressman – commented. Which is saying something, considering he emerged victorious. Keep on being the dad we all want and need, Mr. Delgado. Props.